1. Add a new rule. Click Task Manager -> Application Filter -> Add Rule. Type the program file name that you want to block, choose an effective time section and type rule description, then press "OK" button. This rule means that Employee Activity Monitor will block notepad.exe at anytime. 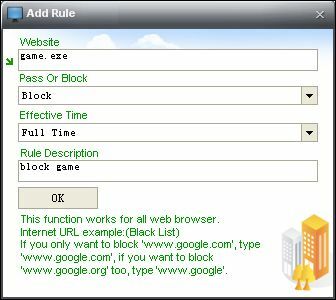 You also can add game or any other unwanted program to blocking list. 2. Deploy rules to employee's computer. a) Choose destination computer from computer list. b) Choose rules from View Black List. c) Click Task Manager -> Application Filter -> Deploy To Agent. d) If you want to view remote computer's rule status , please click Task Manager -> Application Filter -> Get Agent Status. NOTE: if you want to create a new effective time section, please click Settings -> Time Schedule-> Add New Section.